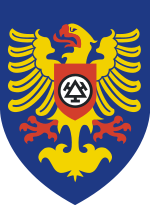 Třinec Coat of Arms. 25 to 26 April, Třinec. The ELEVATOR project on Accessible Tourism Training holds its first partner meeting and workshop for tourism SMEs in the Czech Republic. ELEVATOR is a 3-year Strategic partnerships for adult education project financed by the ERASMUS+ Programme of the European Union. On the first day the project partners from Czech Republic, Belgium, Greece, Italy and Slovenia will hold a closed meeting to review the work done during initial phase of the project and plan the next stages. On 26th April, from 09.00 to 12.00 a thematic workshop will take place at Hotel Steel, Třinec, with local representatives of the tourism and hospitality sector and educational sector. The workshop will address “Accessible tourism staff training“, presenting the business benefits and discussing training needs, programmes and methods for developing the necessary competences among managers and staff. This will be an "exploratory" workshop - not a training session, as such. The aim of the workshop is to present various approaches to training in accessible tourism, including experiences from Czech Republic, Greece, Italy and Slovenia. Participants will have the opportunity to ask questions and discuss training issues with the project partners. This event will be very valuable for the next phase of the ELEVATOR project, in which new training materials and methods will be developed.